NQ Mobile, Avago Technologies, and Atmel just finished a great week, but along three very distinct routes. Curious? Read on. The stock market just finished a weird week, powered by worries about the Chinese and American economies. The S&P 500 index started Monday's trading with a 5% plunge, but recovered to post a 0.9% gain for the entire week. Dow Jones Industrials swung from a 6% Monday drop to a 1.1% final gain. The tech-heavy NASDAQ Composite market barometer outdid them both, falling as much as 9% at first but then posting a 2.6% 5-day surge. But some tech stocks stretched the bumpy market ride to extremes. Analog semiconductor titan Avago Technologies (NASDAQ:AVGO) beat the market in an old-fashioned way this week, crushing analyst expectations in a fresh third-quarter report. NQ Mobile (NYSE:NQ), which runs advertising, entertainment, and security services for mobile users in China, started with an earnings surprise and followed up with an encouraging plan to raise extra cash. Microcontroller and touch sensor maker Atmel (UNKNOWN:ATML.DL) took a very different path. The company's CEO delayed his retirement in order to complete the current strategic evaluation process, which many investors see as code for "buyout talks." All three of these tech stocks followed the general market along for a negative ride early in the week, but then delivered market-beating returns in the end. 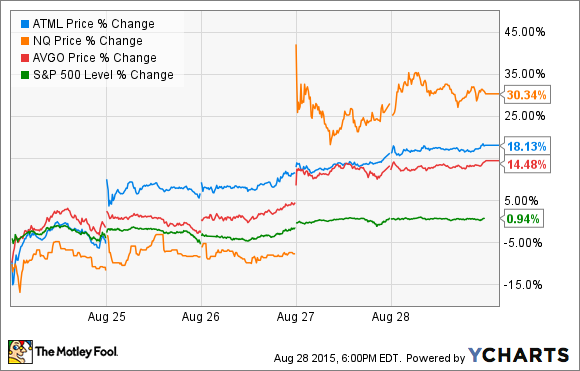 Want to dig deeper into these story stocks? Let's get started. Online video platform Showself is an important piece of NQ's revamped strategy. Source: NQ. On Wednesday night, NQ Mobile reported second-quarter results, and it was good stuff. Analysts were expecting earnings of $0.05 per American Depositary Share on roughly $102 million in total sales. The revenue figure was right on target, but NQ delivered adjusted earnings of $0.08 per diluted ADS instead. The sales figure represented a 25% year over year improvement, driven by 48% higher sales of enterprise mobility services. In turn, NQ's management pointed to strong demand for Apple (NASDAQ:AAPL) iPhones across China's cubicles and office parks. That trend adds weight to Apple CEO Tim Cook's recent claims that Apple's Chinese business is doing well. Meanwhile, NQ's earnings retreated from $0.20 per ADS in the year-ago quarter. The cost of revenues increased 41% year over year, far outpacing the top-line growth. That rapidly rising enterprise segment happens to come with thin margins, since that division ships a lot of expensive hardware while the rest of NQ largely depends on high-margin software sales. Looking ahead, NQ is developing more distribution channels for its enterprise software products, which should lift that division's profit margins in the long run. For the full fiscal year, NQ now expects revenues of approximately $458 million. $111 million of that yearly total should fall in the upcoming third quarter. The third-quarter guidance sits below the current analyst outlook, but the full-year target stands above the Street's $451 million consensus estimate. At the same time, NQ announced the sale of two businesses. A subsidiary of Chinese technology giant Tsinghua Unigroup is picking up mobile gaming operation FL Mobile for roughly $626 million. Business-to-business consulting outfit NationSky is going private in an $80 million all-cash bid from one of that unit's original founders. The sudden $706 million influx of fresh cash will triple NQ's reserves of cash and short-term investments, opening the door to new ventures or acquisitions. For a company with a $335 million market cap, that's a game-changing pile of dollar bills. Management hopes to widen the enterprise division's profit margins, which would let NQ enjoy both rampant sales growth and strong earnings at the same time. There's a lot of work left to do, but this quarter's unit sales were moves in the right direction. The NationSky and FL Mobile sales leaves NQ focused mainly on consumer-oriented social networking and entertainment services, with a sliver of high-growth enterprise security operations on the side. NQ shares opened an astonishing 53% higher the next morning. The stock then fell back a bit, but still closed the week 30% higher. This jumpy stock has now gained 9.3% in 2015 but fallen 36% in the last 52 weeks. The stock is trading for less than 6 times forward earnings estimates today, because investors are uncomfortable with shrinking profits even while sales are soaring. Apple's iPhone 6 depends on Avago's wireless signal amplifiers. Source: Apple. Thanks, Apple! May we have another? Avago Technologies also reported results on Wednesday night, covering the semiconductor maker's third quarter. Sales rose 37% year over year to land at $1.34 billion, driven by two large all-cash acquisitions during the last 12 months totaling $918 million. Adjusted earnings jumped 78% higher to $2.24 per diluted share. Again, the sales figure was right in line with Wall Street analyst targets, but their bottom-line estimates stopped at $2.14 per share. Boosted by both the PLX Technology and Emulex buyouts plus high single-digit organic sales growth, Avago's enterprise storage segment grew sales by 46% year over year. Wireless product sales jumped 69% year over year, but the bulk of that surge is already several quarters old. Avago's wireless revenues jumped 73% in the fourth quarter of 2014 as Apple ramped up its iPhone 6 builds with Avago's radio signal processors inside. Apple is already starting its next iPhone production cycle. Based on that bubbling surge and other inside business readings, Avago set its fourth-quarter non-GAAP earnings guidance at roughly $2.38 per share on $1.85 million in sales. The EPS stands slightly above Wall Street's current $2.33 projection. This stock looks pricey when judged by its trailing results, but quite affordable in a forward-looking mode. The recent spate of mostly small but effective acquisitions have weighed on Avago's recent income statements, but promise to strengthen the business in coming quarters. Avago shares rose 14.5% this week, lifting the stock's 52-week performance to a 68% gain. The stock has more than tripled over the last two years. Investors can thank Apple for a large chunk of this surge, and there should be more of the same helpful Cupertino boost on tap in the next couple of quarters. Atmel CEO Steve Laub. Source: Atmel. Finally, Atmel took its biggest leap this week on Tuesday. Monday night, Atmel CEO Steve Laub announced that he would delay his retirement, originally planned for the end of August as reported approximately four months ago. Why? Because the company needs more time to complete a review of its strategic options, so it would be best if Laub held the rudder for a little while longer. That strategic review was news to Atmel investors, unless you count rumors and leaks about a potential buyout exit. The chip sector is awash in big buyouts these days, and Atmel could very well find a well-heeled suitor with a taste for the company's touch sensor technologies and other embedded systems. The company is a nicely packaged bet on the Internet of Things, ready for quick integration with a larger partner. So all of this makes sense. That being said, three buyout rumors and a dollar could buy you the Sunday paper. Strategic reviews might end up in a buyout or a merger -- or pursuing totally new markets and products, or starting a joint venture somewhere, or even walking away empty-handed from whatever negotiations went on behind the scenes. There's no real news here until Atmel actually announces a real business outcome. Until then, the company has a reluctant interim CEO running the same old show as before. May I remind you that the company missed Wall Street's estimates on both the top and bottom lines in its most recent quarterly report? Take this strategic review with a grain of salt. Atmel was a superstar four years ago, and a leader in that era's smartphone touchscreen controller market. Other providers have stolen Atmel's thunder since then. Sales, earnings, and cash flows have all moved downward, and investors have lost money. Whatever happens next won't exactly make millionaires out of Atmel shareholders. At best, even a generous buyout would only partially heal the wounds suffered since 2011.